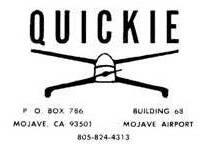 âI saw you fly the Quickie on Sunday, October 15th, at Mojave Airport. You probably do not remember me, but at the time I was the only spectator and was able to talk to Gene Sheehan while watching you fly. It was very nice to have information given and questions answered during an actual flight demonstration. 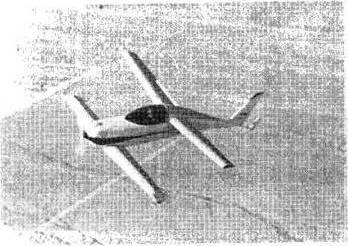 I was impressed and hope that I will be able to build one as nice and fly it as well as you did. I canât think of a more pleasant way to spend a few hours to âget away from it allâ. âFlying a Quickie is the most fun that a person can have in public during the daytime." âTo sum up, the Quickie has achieved its design objectives; to be an easy to fly, easy to build, safe flying machine that is low in cost and quite possibly the ultimate adult toy.